Percy Jackson Sea of Monsters is the second installment based on the novel series. 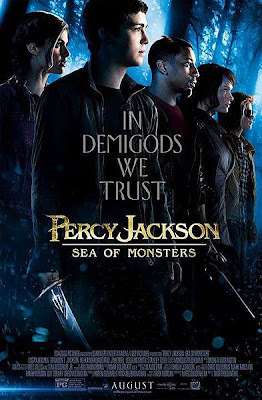 Even though the story is full of gods and demigods, not even divine intervention could save this movie from the mediocre acting and editing that plagues this movie. I enjoyed reading as a child the stories of Zeus, and Hercules and the other Olympian gods. So it's quite disappointing the second time around that a possibly interesting tale falls spiraling down as Icarus did when he tried to fly. Most of the original cast is back aside from Pierce Bronson who is replaced by Anthony Head as Chiron. While I have nothing but praises for the two female leads, Alexandra Daddario and Leven Rambin, Logan Lerman seems out of place and unsure at times. A lot of the jokes by him and the other casts such as new character Tyson played by Douglas Smith are delivered and followed by awkward silence from the audience. It's not entirely the fault of the cast as the dialogue leaves you yawning until the next action scene. Transitions from scene to scene are so abrupt that audiences have no time to react. Yes there are a lot of things wrong with this movie. 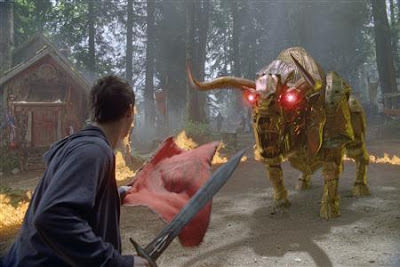 What you will enjoy though are the special effects of the movie, from the mystical creatures to the battle scenes. My favorite being the Colchis Bull in the beginning that attacks the camp. As I've said before Alexandra Daddario and Leven Rambin outshine their male counterparts in the film. But I also have to give praise to Nathan Fillion who appears as Hermes. The Castle/Serenity/Firefly star is humorous and everything the young stars of the movie should be emulating. Overall, I would not recommend watching this in theaters but waiting for it on Netflix or VOD. I have not read any of the books but did enjoy the first movie more. I watched this movie in 2D. Hopefully, the next movie in the franchise The Titan's Curse can make us forget this Greek tragedy. Bjorn Yearwood portrays a younger Grover. Alisha Newton portrays a younger Annabeth. Samuel Braun portrays a younger Luke. Katelyn Mager portrays a younger Thalia.